4Easysoft ASF Video Converter brings different experiences to convert various videos to ASF files. It provides an easy and completed way to convert mainstream videos to ASF including MP4, M4V, AVI, FLV, 3GP, 3G2, MPG and extract audio from ASF files to MP3, WMA. 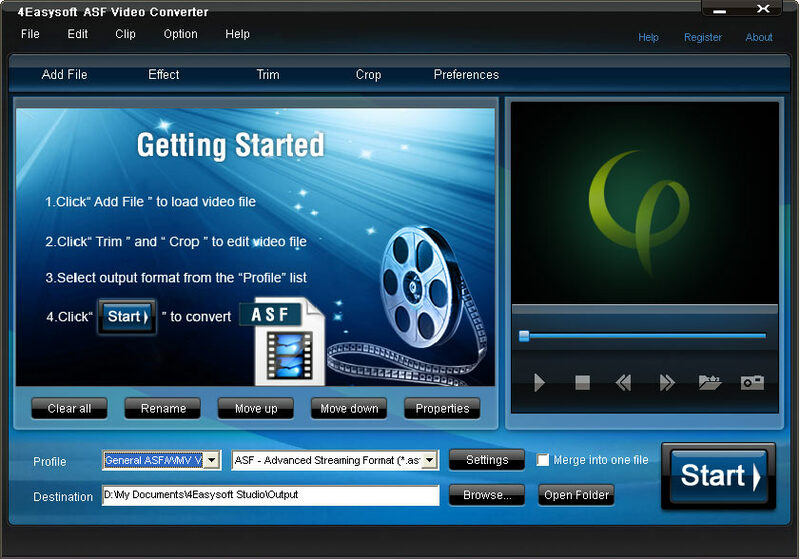 To create ASF videos in your own way, it also offers you rich video editing functions such as video cropping, movie trimming and video joining. Batch conversion is supported. Input HD video formats: HD TS, HD MTS, HD M2TS, HD MPG, HD MPEG, HD MP4, HD WMV, QuickTime HD MOV, HD H.264, HD RM. Output audio formats: MP3, MP2, WMA. Output HD video formats: HD ASF, HD WMV. Set video effect - it assists you to adjust the video Brightness, Contrast, Saturation, you even can use Deinterlacing to helps you convert interlaced video to the progressive video. Qweas is providing links to 4Easysoft ASF Video Converter 3.1.16 as a courtesy, and makes no representations regarding 4Easysoft ASF Video Converter or any other applications or any information related thereto. Any questions, complaints or claims regarding this application 4Easysoft ASF Video Converter 3.1.16 must be directed to the appropriate software vendor. You may click the publisher link of 4Easysoft ASF Video Converter on the top of this page to get more details about the vendor.